The 2012 Star-Spangled Banner $5 Gold Coin honors the bicentennial of the writing of the Star-Spangled Banner and the events which led up to that writing. In addition to the gold coin, the United States Mint offers a commemorative silver dollar for the same reasons. 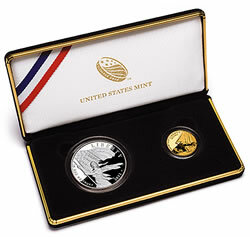 These coins along with a two-coin proof set were released on March 5, 2012. The Star-Spangled Banner was originally written as a poem by Francis Scott Key after witnessing the bombardment of Fort McHenry by British naval forces during the War of 1812. It was later put to music and became the national anthem of the United States in 1931. As with all other modern commemorative gold coins from the United States Mint, the Star-Spangled Banner $5 Gold Coin has a composition of 90% gold to a diameter of 0.850 inches. The strikes feature a maximum mintage of 100,000 to either proof or uncirculated qualities from the U.S. Mint’s facility in West Point, and therefore have "W" mint marks. Numismatic gold products from the U.S. Mint have their prices adjusted up to once a week based on pricing system tuned to the moves of the London gold Fix. While prices can still move up and down weekly, the Mint did set up an introductory period for the coins where they will be $5 less between March 5 and April 5, 2012. On their release day, the proof $5 gold coin was listed at $529.30, the uncirculated coin opened at $519.30 and the two-coin proof set debuted at $579.30. The set includes one proof $5 gold coin and one proof silver dollar. These products may be purchased from the U.S. Mint website at http://www.usmint.gov/catalog. Both the gold coin and the silver dollar were authorized by Congress with the tar-Spangled Banner Commemorative Coin Act (Public Law 111-232). The Act was signed into law by President Barack Obama on August 16, 2010. "Baltimore is proud to be the home of the Star-Spangled Banner, America’s national anthem, right here in our backyard. This coin will highlight the critical role Maryland played in the creation of our nation and hopefully inspire people to learn about our state and our country’s rich history," said Congressman C.A. Dutch Ruppersberger (D-MD) who sponsored the original legislation. According to the text of the legislation, surcharges of $35 per gold piece sold will be collected by the U.S. Mint. These surcharges will be sent to the Maryland War of 1812 Bicentennial Commission. to help fund bicentennial activities and help preserve associated War of 1812 sites. Shown on the obverse of the Star-Spangled Banner $5 Gold Coin is a design emblematic of the theme "The Battles at Sea During the War of 1812." It depicts an American sailing ship up front with a damaged, fleeing British ship in the background. Obverse inscriptions include IN GOD WE TRUST, LIBERTY and 1812 – 2012. The obverse was designed by United States Mint Artistic Infusion Program (AIP) Master Designer Donna Weaver and sculpted by United States Mint Sculptor-Engraver Joseph Menna. The reverse contains a design emblematic of the theme of "The Star-Spangled Banner" (the song). It does so by showing the first words of the national anthem "O say can you see" in the hand-writing of Francis Scott Key in front of a backdrop of 15-stars and 15-stripes. Reverse inscriptions include UNITED STATES OF AMERICA, E PLURIBUS UNUM and FIVE DOLLARS. The reverse was designed by AIP Master Designer Richard Masters and sculpted by Mr. Menna.